Its name refers to the most striking feature: it is the biggest ray species of them all and the largest manta ray, surpassing Manta alfredi or reef manta ray. Morphology. The giant manta ray has a diamond-shaped body, with a wide central “disc” and triangular pectoral fins that when moving in the sea seem to be wings beating. Opposite to the mouth two structures project out called cephalic lobes that are useful when feeding. Although it may be imperceptible at a quick glance, it has a small dorsal fin. Its eyes are on the sides of a slightly concave head. Inside the mouth there are teeth embedded only in the lower jaw. Its tail is thin and whip-like, lacking stingers. Weight and size. The width of the central disc measures up to 9 meters, but individuals have been reported having a measure of 9.1 meters. 1,350 kilograms is the weight that a giant manta ray can have, although other estimates suggest up to 2 tons. Coloration. The skin of Manta birostris is rough and covered with protective mucus. The upper body is black, dark brown or blue-gray while the lower region is white with presence of dark spots. The edges of the pectoral fins are also usually shaded black. The mouth is colored in a dark color, unlike the reef manta ray that has a white mouth. The pattern of spots is unique to each individual, and this is really helpful to identify each. The giant manta ray lives in tropical, subtropical and temperate waters of the Pacific, Indian and Atlantic oceans, often in the area between 31 degrees north and 36 degrees south latitude. 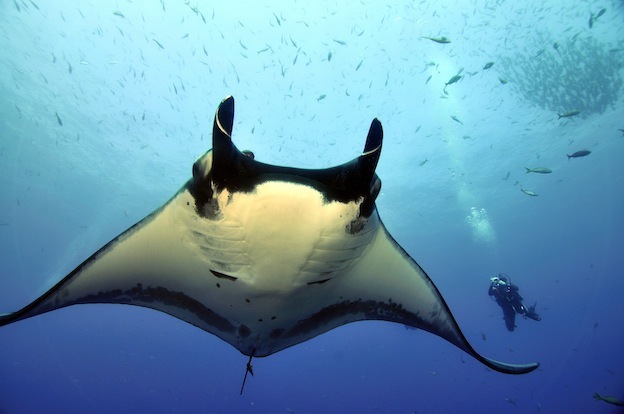 In some areas its habitat overlaps with the reef manta ray. This species prefers to be found offshore at depths of up to 120 meters but close to the ocean surface. It has been seen around groups of islands, along coastlines, in shallow reefs and seamounts. Sometimes it has been seen on the sandy bottom and sea grass areas, but this is not as common. It is also likely to visit coastal sites temporarily. Their diet consists of small aquatic organisms called zooplankton, which it filters through the gill rakers located in the lower body. What it does is introducing large amounts of water through its mouth with the help of the cephalic lobes; the gill rakers work as a sieve to take advantage of planktonic organisms. It has been seen feeding near shore and offshore. This species tends to navigate the ocean slowly and elegantly and often it is found on the surface of the water. However, it is also able to acquire a considerable speed and dive to 1,000 meters deep. Possibly, Manta birostris is more migratory than Manta alfredi, because the latter tends to reside longer in specific areas. It has also been seen less in the company of other manta rays but it does visit cleaning stations regularly for other fish take care of removing parasites and dead skin. The female giant manta ray sexually matures around 8-10 years of age, although it may be a few years later. Meanwhile, males reach maturity when their disc width is about 4-4.5 meters. Long courtship that last for several days have been observed, with the presence of the so-called “mating trains” characterized by the formation of a row of several males who follow the movements of a receptive female, trying to mate with her. The competition ends when she chooses a male. Then it transfers the sperm through one of its claspers or copulatory organs, so that fertilization is internal. The eggs develop inside the mother for about 12 months and they hatch right there, so the offspring are born alive. The reproduction rate in manta rays is very low. The number of offspring that a female normally has is 1, and in some cases 2. Manta birostris is in the “vulnerable” category of the Red List of the International Union for Conservation of Nature (IUCN). It is strongly threatened by the direct fishing and bycatch, and its skin, liver, meat and gill rakers are traded to some extent. However, the trade of manta ray meat is not widespread. Other threats to their survival are pollution and degradation of their habitat, collisions with ships and the negative effects of global warming. The species is protected by the laws of Maldives, Hawaii, New Zealand and other regions, and is included in the Convention on Migratory Species (CMS). In the Maldives there are two protected areas created specifically for its conservation.